Indonepal Kakaji Travels is a specialized tour operator from Gorakhpur, Uttar Pradesh (East UP). 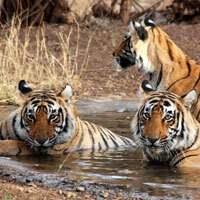 Our forte lies in operating Wildlife Tours across several national parks of India as well as Nepal. No matter you are interested in exploring wildlife at Sariska National Park (Rajasthan) or Jim Corbett National Park (Uttarakhand), our expertise in Wildlife Tours will take you to the next level of your imagination. Not only this, we can also take you to the first national park of Nepal i.e. Chitwan National Park, which is home to at least 43 species of mammals and 543 species of birds. We work with the motto of rejuvenating your soul with exotic wildlife. Thus, we let you focus purely onto wildlife tours, while every hassle of the tour will be solely managed by us.